A small plane on Sunday crashed into a residential area in Yorba Linda, a city in California’s Orange County. Video shared to Twitter by an individual who said they were a resident of the area appeared to show the scene of the crash, with a home totally engulfed in flames as residents in the area were told to move away from the site. 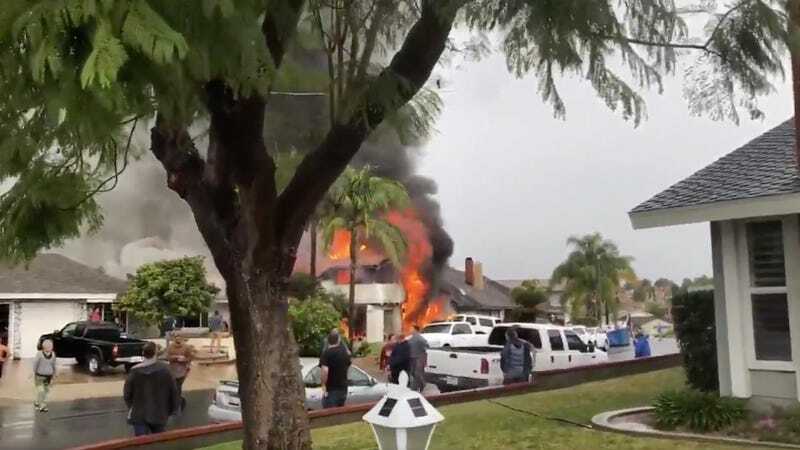 According to the Orange County Sheriff’s Department, five people are dead in the incident, including the pilot as well as four people who were inside the home. Allen Kenitzer of the Federal Aviation Administration told Gizmodo by email that the aircraft was a Cessna 414A. Kenitzer said that the aircraft had recently taken off from the Fullerton Municipal Airport, but that the exact circumstances involved in the crash were unknown as of Sunday evening. Carrie Braun, a spokeswoman for the Orange County Sheriff’s Department, told the Los Angeles Times that the department received a call about the crash around 1:45 p.m. local time. The scale of the damage was not immediately clear at the time of publishing. Despite initial reports that multiple homes had been affected, the Orange County Fire Authority said that only one structure was involved with the incident. Update 2/3/19 7:30 p.m. ET: This story’s headline has been updated to reflect a report from the Orange County Fire Authority that one home was damaged in the fire, rather than multiple. It has also been updated to reflect fatalities and injuries in the incident. Update 2/3/19 1:00 p.m. ET: This story was updated to reflect that five people died in the incident, rather than two as was initially reported by the Orange County Fire Authority. This is a developing story and may be updated throughout.